Individual risk factors associated with the development of severe alcohol withdrawal syndrome (SAWS) included a history of delirium tremens and baseline BP ≥ 140mmHg but no individual symptoms or signs were associated with exclusion of SAWS. Composite measures fared better, such as the Prediction of Alcohol Withdrawal Severity Scale (PAWSS); a score ≥ 4 had a LR of 174 (95% CI 43-696). Severe alcohol withdrawal is associated with significant morbidity and mortality, as high as 15% historically. While it is easy to identify a patient in florid alcohol withdrawal, at that point the train has already left the station. Several tools and individual risk factors have been evaluated for their ability to predict SAWS in this article. Alcohol withdrawal syndrome (AWS) classically occurs during the first 24 hours of abstinence and is marked by autonomic hyperactivity, which may manifest as tremor, tachycardia, diaphoresis, nausea, vomiting, hypertension, hyperthermia, or disorientation. Individual risk factors associated with the development of SAWS included a history of delirium tremens (LR 2.9 [95% CI 1.7-5.2]) and baseline BP ≥ 140mmHg (LR 1.7 [95% CI 1.3-2.3]). PAWSS (see figure below) is a screening tool that has a maximum score of 10. Each question is equally weighted. In the pilot study, Maldonado et al., demonstrated that if you used a threshold score ≥ 4 there was a 100% sensitivity and specificity in determining whether a patient would develop moderate or severe AWS. Positive LR ≥4 was 174; negative LR with a score of ≤3 was 0.07. Ultimately, this article from The Rational Clinical Examination series showed that it is difficult to determine who will develop SAWS from individual patient variables, and there may be utility in using one of these composite scores to help make the determination. However, you should take caution as none of these tools have been validated. 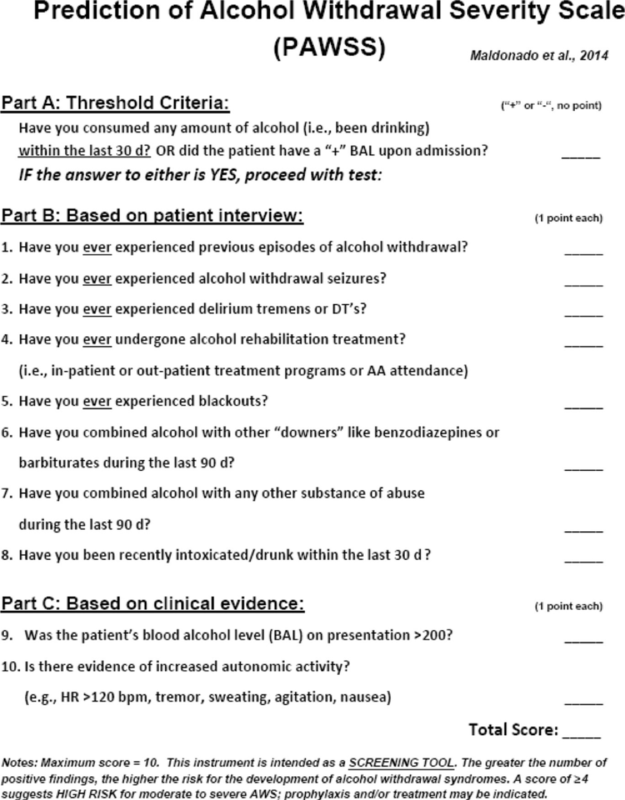 Will This Hospitalized Patient Develop Severe Alcohol Withdrawal Syndrome? : The Rational Clinical Examination Systematic Review. JAMA. 2018 Aug 28;320(8):825-833. doi: 10.1001/jama.2018.10574.